WHERE you stay in Chicago. The best way to savor Chicago is by walking its streets. Walking isn't always practical, however, when you choose to investigate what all the unique neighborhoods have to offer. Fortunately, Chicago has a myriad of transportation options. The Historic Loop is the name given to the two mile circuit of elevated railroad that forms the hub of the 'L' rapid transit system. 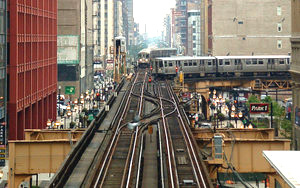 The Loop is so named because the railroad loops around a rectangle formed by Lake Street (north side), Wabash Avenue (east), Van Buren Street (south), and Wells Street (west). If you're visiting during the summer the city of Chicago operates free trolleys daily between Michigan Avenue and the Museum Campus (site of the Adler Planetarium, the Field Museum of Natural History, and the Shedd Aquarium); the trolleys run only on weekends in the fall and spring. Free trolleys also run year-round between Navy Pier and the Grand/State El station on the Red Line. While the trolleys are supposed to make stops every 30 minutes, waits can be far longer during peak tourist season -- and the trolleys aren't air-conditioned. If you get tired of waiting, remember that CTA public buses travel the same routes for only $1.75 per person. 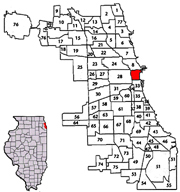 Below is a listing of several popular neighborhoods in Chicago. The first being The Loop/Downtown Chicago. The other neighborhood locations will be relative to The Loop. Downtown Chicago is bounded by the Chicago River to the north and west, Michigan Avenue to the east and Roosevelt Avenue to the south. The Loop is the core of the Windy City's downtown area. It's the center of Chicago's cultural, governmental, and business communities and is encircled by The Loop, named for the elevated train tracks that loop around the central area. Landmarks for this part of town include the Sears Tower and the Chicago Board of Trade. However, Downtown Chicago is NOT defined by The Loop. Just check out the surrounds (below)! The South Side of Chicago is one of the fast-growing residential neighborhoods in the city but is also home to the beautiful Washington Park, The University of Chicago, and several museums, including the Museum of Science and Industry. 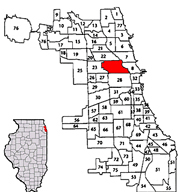 The Chinat own neighborhood is on the near South Side (located in the Armour Square community area), centered on Cermak and Wentworth Avenues. It is not to be confused with an area sometimes called "New Chinatown", which is on the North Side around Argyle Street, and which attracts a larger number of people of Southeast Asian heritage. 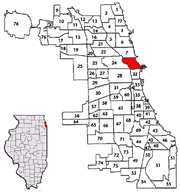 Hyde Park is a neighborhood on the south side of Chicago, located seven miles south of the Chicago Loop. It is home to The DuSable Museum of African American History, the Hyde Park Art Center, the Museum of Science and Industry, The Renaissance Society, and the University of Chicago. Numerous shops south of Roosevelt Road with "South Loop" in their name hint that this more generous definition may be gaining recognition. Printers Row also known as Printing House Row, is a neighborhood located south of the Chicago downtown area known as the Loop. It is bounded by Congress Parkway on the north, Polk Street on the south, Plymouth Court on the east, and the Chicago River on the west. The signature street is Dearborn Street where the annual Printer's Row Book Fair is held. Originally, the buildings in this area were used by printing and publishing businesses. Today, the buildings have mainly been converted into residential lofts. 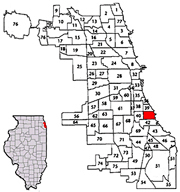 The West Loop makes up the northeast quadrant of the Near West Side, just west of Chicago's Loop. It is bordered by the River to the east, Lake Street on the north, Congress Parkway to the south, and either Halsted or Ashland to the west. The West Loop is a former manufacturing corridor turned artists neighborhood. It's made up primarily of warehouses that are still in use or recently converted to loft condominiums, restaurants, night clubs, a growing number of art galleries, and some retail. The West Loop is also the home of Harpo Studios, owned by well known talk show host Oprah Winfrey, and the production site of her syndicated show. Hotels, Attractions, Restaurants and TICKETS for EVERYTHING from Concerts to Sports to Theatre & Events. Greektown, the Greek culinary center of the city, is surrounded by Kinzie and 16th Streets on the north and south and the Chicago River and Ogden Avenue on the east and west within the Near West Side community. It was popularized in the movie "My Big Fat Greek Wedding," which ironically was filmed mostly in Toronto. The Little Italy neighborhood is a fraction of what it once was, but it still has a marked presence in Chicago due to its famous restaurants. It encompasses 12 blocks on Taylor Street between the Illinois Medical District and the UIC campus. The North Side/Near North Side lies just north of the Chicago River. It encompasses several of the more upscale residential neighborhoods and shopping areas. 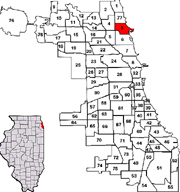 The Gold Coast extends south to Oak and west to LaSalle, excluding the Carl Sandburg Village housing development between LaSalle, Dearborn, Division, and North. It is one of the most affluent neighborhoods in Chicago, consisting mostly of high-rise apartment buildings on Lake Shore Drive, facing Lake Michigan, but also including low-rise residential blocks inland. The Magnificent Mile is a stretch of North Michigan Avenue between the Chicago River and Oak Street. (actually it's only about three-quarters of a mile) and is lined with exclusive shops as well as a few historic buildings that survived the Great Fire of 1871.) In addition to high-class stores, there's a mixture of restaurants, office buildings and hotels. The area has a high concentration of the city's major media firms and advertising agencies, including the Chicago Tribune newspaper. 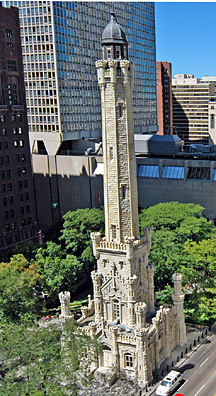 The Magnificent Mile is the home of Chicago's famous Water Tower landmark, Water Tower Park with its historic clock, and the eight-level Water Tower Place shopping center. The shopping center is anchored by two department stores: Macys North Michigan store and Lord and Taylor. North of the shopping center is he famous John Hancock Center, the art deco Palmolive Building and the lavish Drake Hotel. "Streeterville" is an area stretching east of Michigan Avenue to the l ake. It is bounded by the river on the south, Michigan Avenue on the west, and Lake Michigan on the north and east. In the late 1880s, George 'Cap' Streeter's boat hit a sandbar just off the shoreline and there it stayed; he and his wife made this their new home. The Streeters encouraged dumping in this area and, after several years, the debris built up and became solid land. George claimed this 'new land' as an independent territory in respect to an 1821 government survey that declared Chicago, and Illinois, property lines terminated at the shoreline. Under his homesteading rights as a Civil War Veteran, he declared the new land to be the District of Lake Michigan. Eventually the land was seized by force, and it is now home to some of what has claimed to be the most expensive real estate in Chicago. Streeterville houses many of Chicago's tallest skyscrapers and most upscale stores, hotels, restaurants and theaters, as well as Northwestern University's Feinberg School of Medicine and School of Law. The Magnificent Mile portion of Michigan Avenue is part of Streeterville, as is the number one tourist attraction in Chicago, Navy Pier. 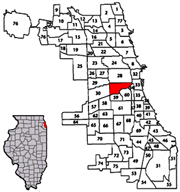 River North is also found in the Near North Side community. It is bounded by Rush Street to the east, Chicago Avenue to the north, and the Chicago river to the south and west. This neighborhood has the largest concentration of art galleries in the United States outside of Manhattan. River North is also home to hot dance clubs and celebrity-owned restaurants. There are bistros and boutiques housed in century-old warehouses, and the world's largest blues and jazz record shop. Several large-scale residential loft-conversion developments have also sprouted on its western and southwestern fringes. Lincoln Park is a popular residential neighborhood bordered by Lakeview to the north, Logan Square and West Town to the west, and Near North to the south. It's bordered on the east by the huge park, which is home to two major museums and one of the nation's oldest zoos. It is home to some of the trendiest shops, bars, music clubs and off-loop theaters. It is also home to the famous Steppenwolf Theatre Company. Old Town is bounded by Armitage Avenue on the north, Division Street on the south, Larrabee Street on the west, and Clark Street on the east. It sits inside the larger neighborhood known as Lincoln Park. Formerly a working class neighborhood, Wrigleyville, also called Central Lakeview, is the neighborhood directly surrounding Wrigley Field along North Clark and West Addison Streets. Wrigleyville features lowrise brick buildings and houses, some with rooftop bleachers colloquially called Wrigley Roofs where people can purchase seats to watch baseball games without having to pay Major League Baseball ticket prices. Proprietors are able to do so under special agreements with the Chicago Cubs organization. Wrigleyville bars and restaurants (particularly on Clark St.) feature the sports culture with sports oriented themes. Sluggers, Hi-Tops, Cubby Bear and Barleycorn guest the Cubs crowds in the famed Clark St and Addison St. intersection of Wrigley Field. This area has been a staging ground for a number of Hollywood movies. In addition, the area's Irish American roots are evident with Irish pub themes, as well. While the specialty drink in trendy Lake View East bars might be a custom-made cocktail, beer by the pitcher is much more heavily advertised in Wrigleyville establishments. Murphy's Bleachers is one place to see this in action. 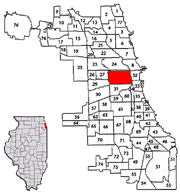 Uptown is a diverse neighborhood located north of Chicago's downtown. Bounded by Foster on the north; Lake Michigan on the east; Montrose (Ravenswood to Clark), and Irving Park (Clark to Lake Michigan) on the south; Ravenswood (Foster to Montrose), and Clark (Montrose to Irving Park) on the west. Uptown borders three community areas and Lake Michigan. To the north is Edgewater, to the west is Lincoln Square, and to the south is LakeView. Formerly abandoned buildings are being converted into condominiums and lofts. The Vietnamese and Chinese immigrants have transformed Argyle Street between Broadway and Sheridan Road into a teeming market for fresh meat, fish, and exotic vegetables. Just north and west is the old Scandinavian neighborhood of Andersonville, whose main drag is Clark Street, between Foster and Bryn Mawr Avenues. The area is known for it's Middle Eastern restaurants and a burgeoning colony of gays and lesbians. Lincoln Square is bounded by Peterson Avenue and Bryn Mawr Avenue on the north, Montrose Avenue on the south, Ravenswood Avenue on the east and the Chicago River on the west. Once a vast German-American community, it is now experiencing an influx of white middle-class families into private residences and small apartment buildings. Many new shops now cater to Thai or Middle Eastern cultures. However, the neighborhood is still home to a number of German businesses, the Chicago Brauhaus, Meyer's Delicatessen, Merz Apothecary and Lutz Continental Café. Rogers Park (map) is bound by the City of Evanston at Juneway/Howard Street to the north, Ridge Boulevard to the west, Devon Avenue to the south and the shores of Lake Michigan to the east. The eastern half, dominated by Loyola University and it's Jesuit religious order lakefront campus, has become popular cosmopolitan melting pot: African Americans, Asians, East Indians, German Americans, and Russian Jews live side by side with the ethnically mixed student population drawn to the Catholic university. The west end of Devon Avenue is a slice of Calcutta, colonized by Indians who've transformed the street into restaurant row serving tandoori chicken and curry-flavored dishes. Historic places of interest include Madonna Della Strada and the site of the former Granada Theatre. 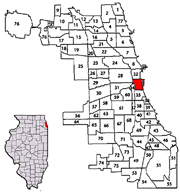 The borders of the Wicker Park neighborhood are Ashland to the east, the above-grade Bloomingdale Line to the north, Division to the south, and Western Avenue to the west. 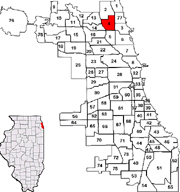 Both the East Village and Ukrainian Village are to the south, Humboldt Park is to the west, and Bucktown is to the north. The Art Deco Northwest Tower is the tallest thing for miles. Wicker Park was once home to industry and wealth, but the neighborhood's Victorian mansions now shelter one of the country's largest artist communities. Although the district sports a bohemian feel, it also features the best in trendy restaurants and shops. 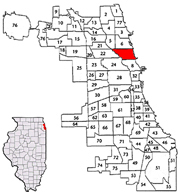 Bucktown and Wicker Park are often used interchangeably, technically Bucktown is the neighborhood north of North Avenue, while Wicker Park is to the south. Pilsen was for decades the principal entry point in Chicago for immigrants of every ethnic background. Centered at Halsted and 18th streets just southwest of the Loop, Pilsen is the second-largest Mexican-American community in the United States. This vibrant and colorful neighborhood, boasts many authentic taquerias and bakeries. If you're visiting in September or October, be sure to check out the neighborhoods' annual Day of the Dead celebration. It's an elaborate festival that runs for 8 weeks. The artistic spirit that permeates the community isn't confined to Latin American art. In recent years all kinds of artists have moved to Pilsen partly by the availability of loft space.18th Street is a lively pedestrian street. The East Side on Halsted is one of Chicago's largest art districts, and the neighborhood is also home to the Mexican Fine Arts Center Museum. Pilsen's original murals along 16th Street started as a cooperative effort between Slavs and Mexicans when the neighborhood was undergoing change. If you look closely you'll find the earlier images are decidedly non-Mexican.